OF® SA-G1 Pro Monster Fishes Carnivore is the latest technological breakthrough in fish nutrition for large Predatory Fishes, as Predatory Fishes have high protein and calcium intake demand especially during their juvenile stage. SA-G1 Monster Fishes stick is the latest technological breakthrough In fish nutrition for big predatory fish. Predatory flshes have very high protein and calcium intake demand especially when they are at the Juvenile stage. This is because these carnivorous giants need to grow rapidly when young In order not to be eaten by other predators. OF food is formulated to ensure that all Predatory fishes will be able to grow rapidly solely depending on SA-G1 as the only food intake and absorb all the necessary nutrients provided. 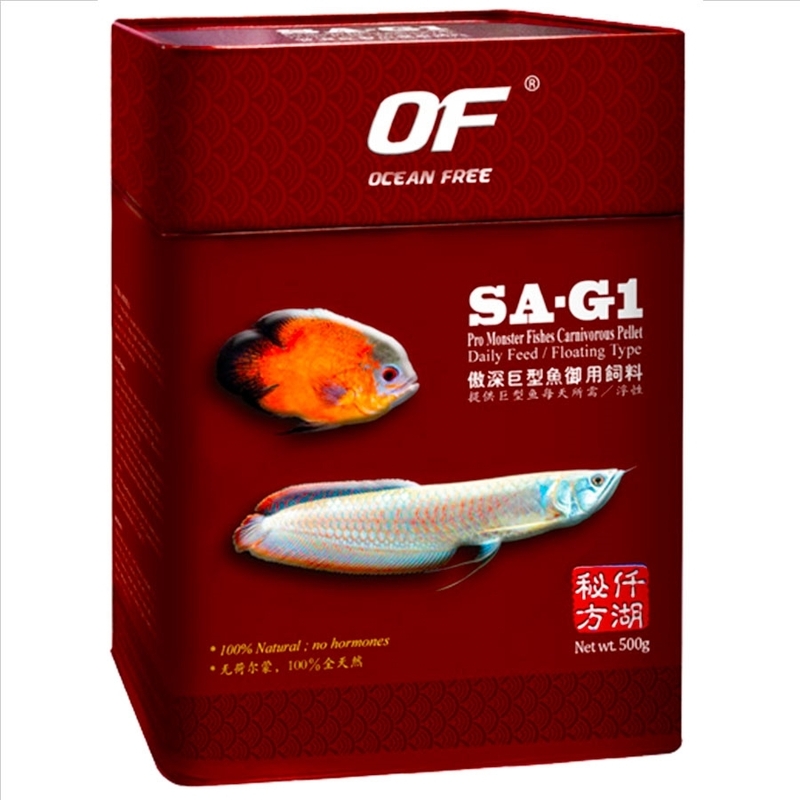 SA-G1 will also improve the colour development in your Predatory Fishes and at the same time ensure sexual maturation when they reach adulthood. This feed is specially formulated to suit the unique development of Predatory fishes includlng all South American Arowana species (Includlng Arapalma species), all Garfish species, all Large Catfishes species, all South American Cichlids, All Central American Cichlids, all snakeheads species, all wolf fish species, all lungfishes species, all bass species, Large Characin species, and some freshwater stingrays. Most Importantly, SA-G1 Monster Fishes stick is a guaranteed hormone-free product that uses only the finest Ingredients to ensure that your Carnivorous Fish receive nutrition of the highest quality. Fish Protein, Quality White Fish Meal, Krill, Spirulina, Wheat Germ, Dried Yeast, Wheat Flour, Antarctic Shrimps, Protease, Stable Multi-Vitamin and Mineral, Lecithin, Immune Substance, Calcium, Enzyme, Organic Minerals, Astaxanthin, Carotenoid and OF Opti Sa.